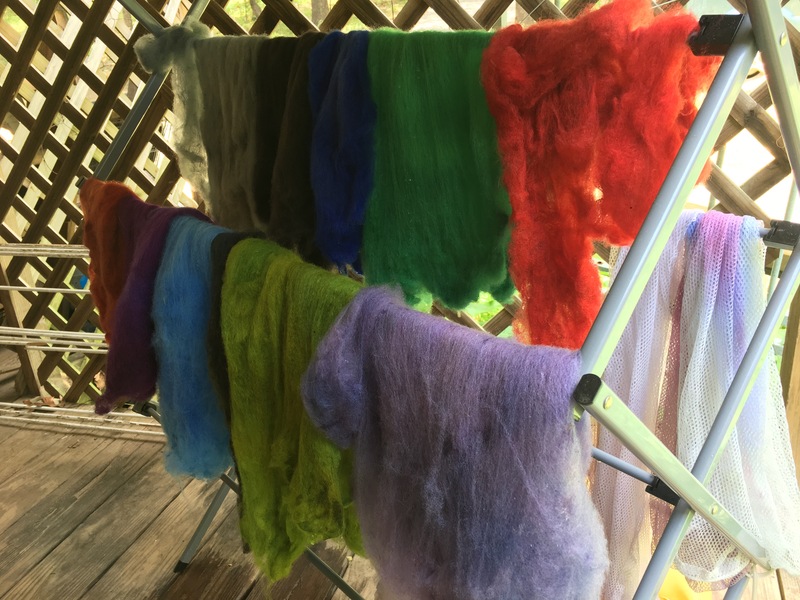 This morning was the day I had set aside this week for dyeing some wool batts. Most of them are 100% Corriedale, but there were a few mixed breed rovings I had made that I threw in different pots just to see what might happen. I had learned a lot about dyeing here at my house today. Previously, I had thought I was just really bad at it. My colors were always muddy, or too pale. I figured out today I just need more acid than normally called for in dyeing instructions. 1/2 tsp of citric acid does not get me the bright sharp colors im looking for; however, bump the citric acid up to 1 tsp and Wow! 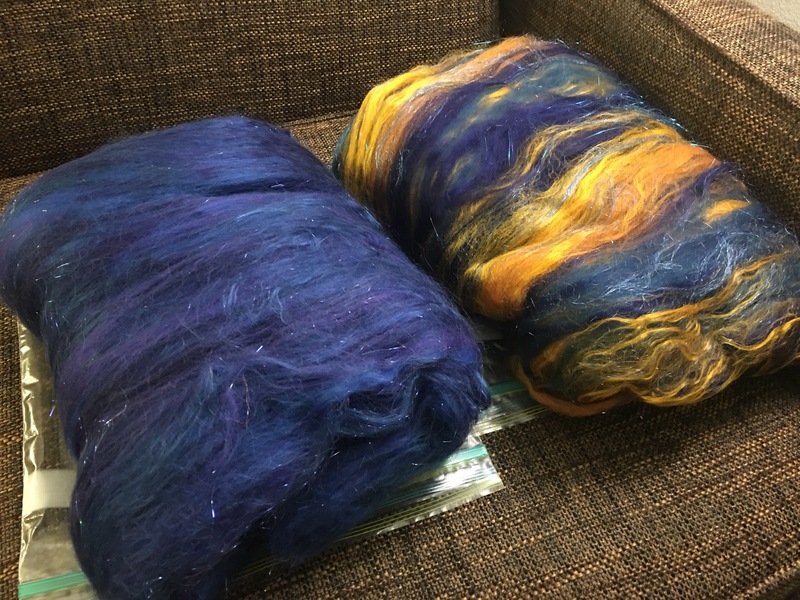 I am much happier, and looking forward to dyeing many more batts in the future. Love this Spicy Red and Amethyst rovings. Fiber Christmas was good to me! I had a wonderful time, my classes were fantastic, and Sean spoiled me the entire weekend! The only down side was I was just getting over a mild case of pnuemonia and Friday after my class I was exhausted. I had to skip the dinner and the guest speaker, go back to the hotel and sleep. My first class Friday afternoon was Fiber Blending with Judy Crouch. She did a fantastic job teaching us why we might want to make a fiber blend, and how to get good results. 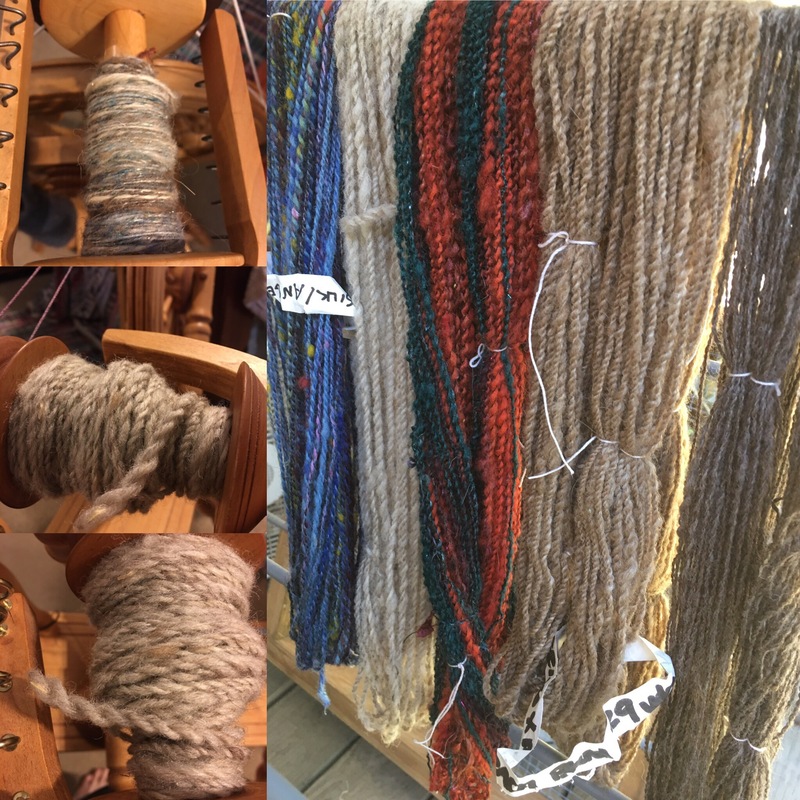 We were encouraged to use all the fiber tools available to experiment with our own fiber blends. 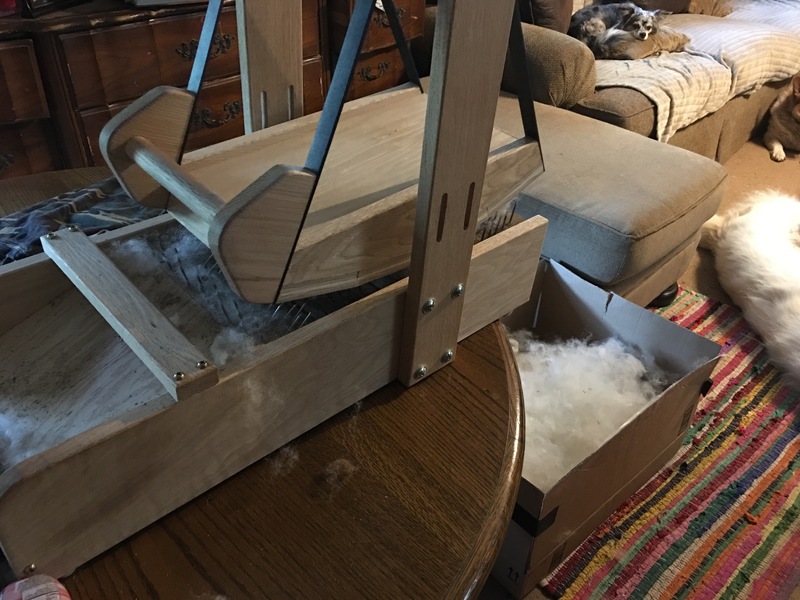 I used 5 pitch combs to blend teeswater (I think) with angelina, hand cards to blend wool top with silk noil, and my drum carder to make an art batt out of wool, silk roving, and other things. I don’t remember what all was in there. 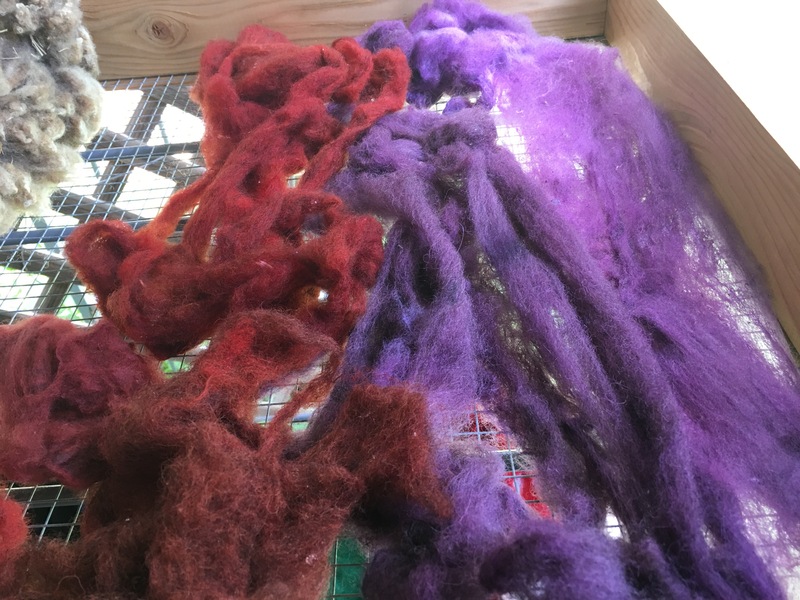 I learned a lot and can’t wait to start blending some of the angora I have from my rabbits with other things. The knowledge I gained from that class will surely serve me a long time. My second class was Solar Dyeing, taught by Dawn Riden. It was meticulously taught. 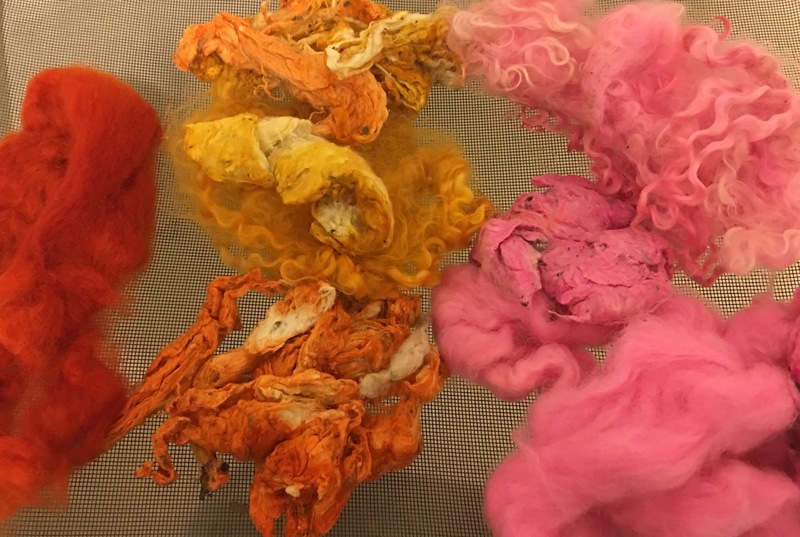 Her mastery and instruction of the subject extended to regular dyeing as well, I think it will really help me get better results in all of my dyeing. 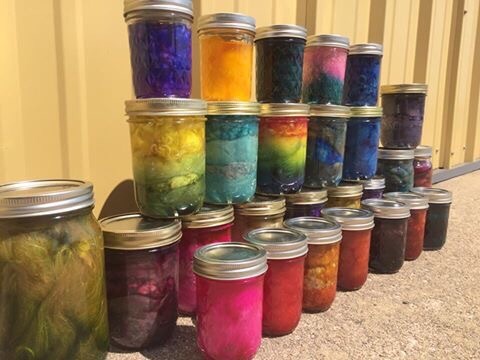 We got to prepare three dye jars with fiber to take home. Then of course it was cloudy and cool for the next several days and I could not get the dye to strike until yesterday. Finally, though, results! Sean bought me way too much stuff while I was in class. The first day, we got back to the hotel and I found these two batts waiting for me, on top of the spindle he’d already bought me while we were perusing the vendors. Then the next day, we came upon a wool picker. It was practically brand new, and the price was reasonable. However, when we went back to look at it after class, it had been sold. Oh well, there were lots of plans for pickers on the internet, and we were sure we could build one ourselves, given enough time. Then I went to get my stuff out of the back of the van, and there was the picker! Sean really likes to pull off surprises and he really succeeded that time! 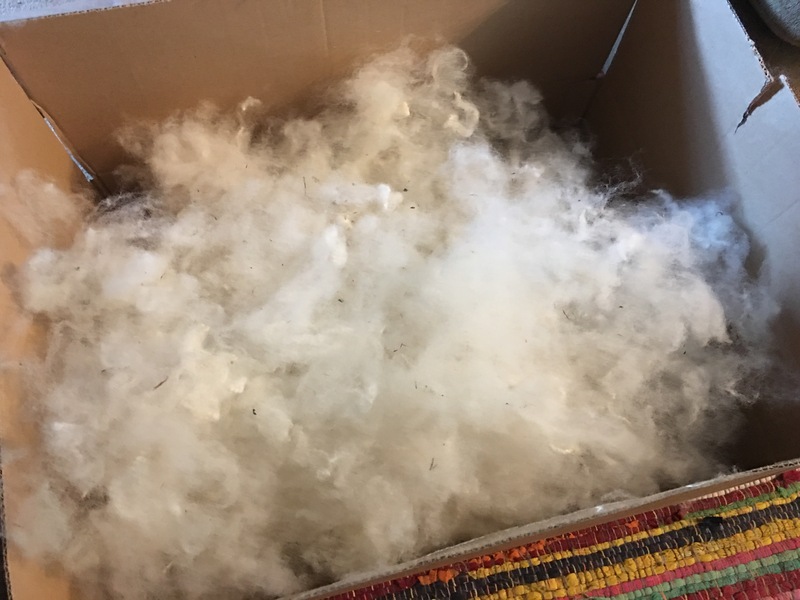 Look at the beautiful cloud of fiber ready for carding! This picker does not have a makers mark that I can see, but looks exactly like a Fancy Kitty swing picker. They haven’t made this model in 7 years, but this one looks brand new. I had a wonderful time. I can’t wait to go back next year!